With swing making the massive resurgence it has the past few years, outfits such as Big Joe & The Dynaflows are finding wider appreciative audiences for the music that has found new life with listeners that were not even born during it's heyday. All Night Long is the latest blend of traditional Kansas City jump blues, R&B and just a taste of New Orleans swing masterfully stirred together with the jiving vocals and shuffling drumming of Joe Maher to produce a smooth wonderfully crafted album. If one didn't know better you would think this recording was cut during the golden era of swing because of it's totally original, yet nostalgic arrangements. 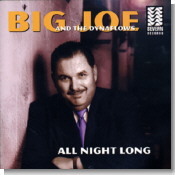 Nine of the album's 12 selections are original numbers written either by Big Joe himself or by other members of The Dynaflows. The title track starts thing off with a high energy dance piece tailor-made for cutting a rug or two, and is followed by the stuttering samba-ish boogie of "Down In Louisiana." Jimmy Witherspoon's "My Baby's Tops" receives a hip shaking treatment and blazing tenor sax work from Derek Huston that makes it irresistible to move to, as does the original "Ham Hocks" featuring equally smoking sax notes from the ever so talented Mark Kazanoff. The lone instrumental, "Mr. Nick," and the smoldering "Honey Bee" are both dynamic grooves evoking memories of zoot suits and swirling skirts on the dance floor. The current incarnation of The Dynaflows are: Ivan Applerouth on guitars, John Cocuzzi burning up the piano, Steve Potter on upright bass and Joe Stanley blowing sax. Fellow label mate Benjie Porecki also lends his exquisite B3 talents to two numbers. If you're already a fan of this very tight unit then this latest biscuit will more than satisfy. If you're new to their sound, then All Night Long is a terrific introduction. Pop this one in your player and make some room because your feet may just take over.